Calling all Michigan students, the FAFSA deadline is fast approaching. Don’t forget that all FAFSA’s need to be completed by March 1 in order to get the most out of your financial aid package for the coming year. Students seeking financial aid must submit a Free Application for Federal Student Aid (FAFSA). The FAFSA application is available from high school guidance offices, the Finlandia University Office of Financial Aid or the FAFSA application can be completed online at fafsa.gov. Federal and state financial aid programs also use information provided by the FAFSA. Failure to fill out your FAFSA could result in loss or depreciation of a student’s government financial aid opportunities. 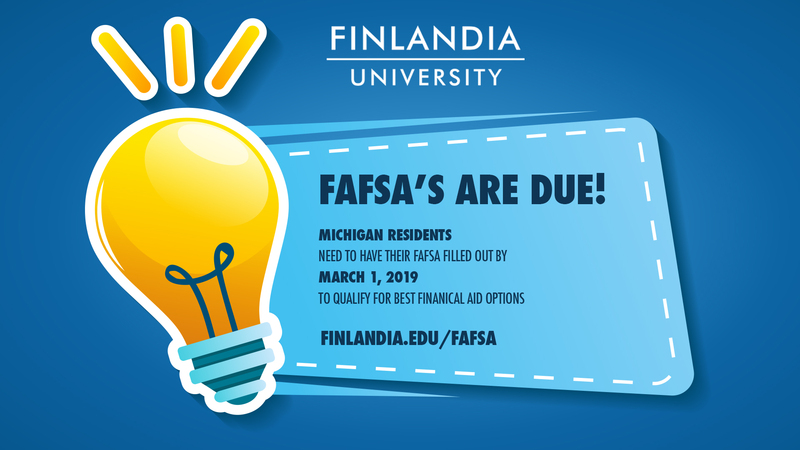 To find out more information visit finlandia.edu/fafsa or contact Director of Student Financial Services, Sandy Turnquist.